Maker Bio & Background: Hi! I’m Ally, the painter behind All Dolled Up Peg Dolls. I’ve been married to my amazing husband Tyler for 6 years and together we have two incredible girls; Claire (age 3) and Evelyn (age 1). By day I work in Operational Risk Management and I love my job! 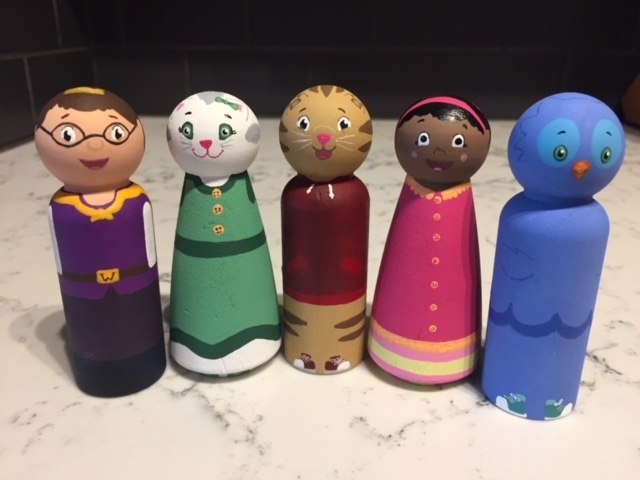 While on maternity leave with my youngest, I was looking for a creative outlet and had previously painted wooden peg dolls as a gift for my good friend’s son. She was actually the one that pushed me to start my little business and All Dolled Up was born this summer. I paint now during evenings and weekends while my kids are asleep. Bringing these dolls to life brings me so much joy and I have passion for creating and trying something new! Description of your products: I hand paint wooden peg dolls into characters. They can be inspired by children’s shows, animals, or families. Why do you create? : I love being creative and most importantly I love watching children play and imagine. I like to think having super awesome open ended toys can help with that. How has your art practice evolved since you first started? : I have only started taking orders for this since May so I think what has most evolved is the time I spent. When I first started I was on maternity leave so I have both of my daughter’s naps during the day and the evenings to paint. Now that I am back at work, I only have the evenings. I have put lots of thought into how I can be more efficient and still maintain quality and attention to detail. My amazing customers are always coming up with new ideas and I enjoy every challenge that comes my way. I think it’s also cool to see the trends of what children are into. How much time do you spend on your art practice? Is it enough? : I spend about two hours in the evenings 6 days a week painting/sealing/preparing to ship. What is the most rewarding part of creating? : Without a doubt, it is when a parent or whoever has ordered dolls sends me pictures or videos of their child enjoying them. I love seeing all the adventures the dolls can get up to!